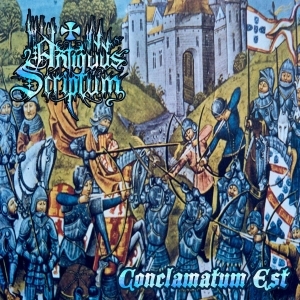 Conclamatum Est too is a re-release, initially from Summer 2010, originally released via the Austrian label Talheim Records, and now available again on CD via Pesttanz Klangschmiede from Germany in a very limited edition (only 100 copies were pressed, I think, for this label; some other labels did a repress as well in mean time, for both CD as well as tape – but that is another thing). The material was recorded in two different Portuguese studios, once again with Nyx Sludgedweller, who did some session instrumentation too on this album. There are some other guest / session musicians involved, by the way, but the better part has been written, composed and recorded by Sacerdos Magus. And oh yeah, before starting the review itself, i.e. the sonic side of the album, a word about the artwork: no idea where everything comes from, but it’s based on medieval paintings, and it does fit to Antiquus Scriptum’s Music for sure. The album is divided into two chapters, as two separated conceptual things (the second part being a collection of cover songs), but the complete album can be seen, from sonic point of view, or listen, as before. Antiquus Scriptum create somewhat grotesque (no, I do not want to use this description in a negative manner, yet rather as a statement of fully-symphonic and operatic orchestration). Different layers of instrumental and vocal bombast create that overwhelming ‘fullness’. There is so much to discover, whether you like it or not. It’s Traditional Black Metal, Dark Symphonic Music, fast-paced Extreme Metal, monumental Orchestral Black Metal, Gothic Black Metal, Horror soundtrack, Epic / Folk Rock / Metal, and so on. And that goes for the whole of the album. But then again, like the other albums I know, there is such a fine coherence going on, despite the lengthy duration, and that’s a proof of professional craftsmanship for sure. Truly, the whole thing stands like a coherent aural journey (once again), to be considered as a brave musical experience (or f*cking sh*t stuff if you’re lacking of open-mindedness). Sacerdos Magus really tries so hard to put such an effort, so much energy and persuasion, in his albums, and that surely goes for this album too. Despite the lengthy duration the listener gets permanently thrilled, constantly challenged to experience new concepts, new ideas, new experiences. Whether a chapter is guitar- or keyboard-driven, epic-folky or fierce, old schooled or more modernised, etc., (almost) every time it does hit the bull’s f*ckin’ eye. But quite the same elegance goes for all other aspects: a variety in between epic parts, harsh outburst, integer moments, dreamlike passages, folky intermezzi and much more, from acoustic to face-smashing, from subtle to pronounced, from traditional to less traditional (? )… An experimental existence without being an exaggerated entity, that’s a statement not that crazy to make. With all cohesive yet quite differing ingredients that appear on this album, I cannot but go into superlatives. The cover-part is another story, but I’ll keep it with: you like it or you do not. Personally, I think some of the seven cover songs have been re-interpreted with such fine attitude, while a couple of others are not. But that isn’t but a personal opinion, and yes, it deals with covers. Objective fact: Venom, Celtic Frost, Slayer, Psycoma, The Invertebrate, Mordaça and Manowar. Subjective fact: I do appreciate the intension to reinterpret these songs with a very own-faced approach. It’s not just another cover execution once again, yet truly an own reinterpretation, and from an objective point of view I cannot but appreciate that idea, evidently. So, it does not matter, in this case, whether the version of Antiquus Scriptum exceeds the original or denigrates it – it’s the intension that shows, and even though not all of them are that satisfying (why on Earth would someone think their cover interpretation of a Slayer or Venom track would be better than the original), I do honestly want to focus on the fantastic ability to create an own thing. Even the covers of stuff from bands Sacerdos Magus was involved before, well, even that is really fun to enjoy! Fans of (early) Morgul or Daemonium / Akhenaton (a.o.) must pay attention. You will surely adore this stuff, I assure you!